Warning: Proud Mummy moment (and another overseas trip). It's nice to be home even if only for a nano-second. Seriously. I've been inside my own house for less than 24 hours and already it's time to take to the skies again. The cankles have hardly had time to disappear and I'm heading off shore again. This time to support my boy as he continues to pursue his soccer dreams. You might recall that our boy has a whole lot of drive, passion and commitment for soccer. You might also recall it has done wonders to build his confidence on and off the field. This new found confidence followed him to the Coerver Soccer Academy where he worked hard on perfecting his skills over six months of fairly intense training. 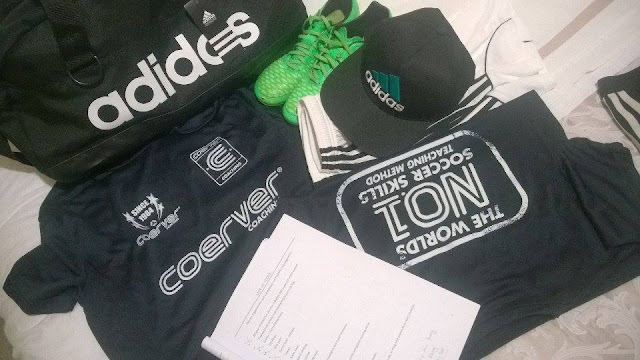 At the end of Coerver Academy he got to try out for their international tour of Singapore. It wasn't an easy goal to achieve and we honestly weren't sure he'd be selected. It turns out that drive, passion and commitment are exactly what Coerver are looking for in their players. Our young man secured a spot on that team and today he takes another giant leap towards achieving his soccer dreams. I can't reiterate enough just how much his enthusiasm for soccer inspires me. To have such a love for his sport and such dedication to his own improvement is very motivating. Today we get all kitted out in our official tour travel gear (yes, Mum has to travel in uniform too) and fly to Singapore. If it wasn't clear before, it is now ... I'm officially a soccer Mum. I can't say I'm loving the clothing. I mean, I'm not really into breathable active sportswear t-shirts as a fashion choice, and the matching cap and bag are a little bland, but hey, apparently I'm part of the team now so what can you do? These will be my clothes for the next ten days. To be honest I haven't managed to get my head around the fact I'm going to be stuck on a plane for another 10 hours after the 35 hours of travel yesterday. But I honestly don't care. This trip isn't about me. It's about a young man who's drive, passion and commitment is showing results. I'd gladly fly to the moon and back and have cankles forever if it means seeing his dreams come true. Well, maybe not cankles forever. They're pretty ugly beasts. Right up there with breathable active sportswear t-shirts. Of course this trip is not completely selfless. I've never been to Singapore so I'm excited about exploring another new country. Plus my kick arse Instagram feed is going to continue! 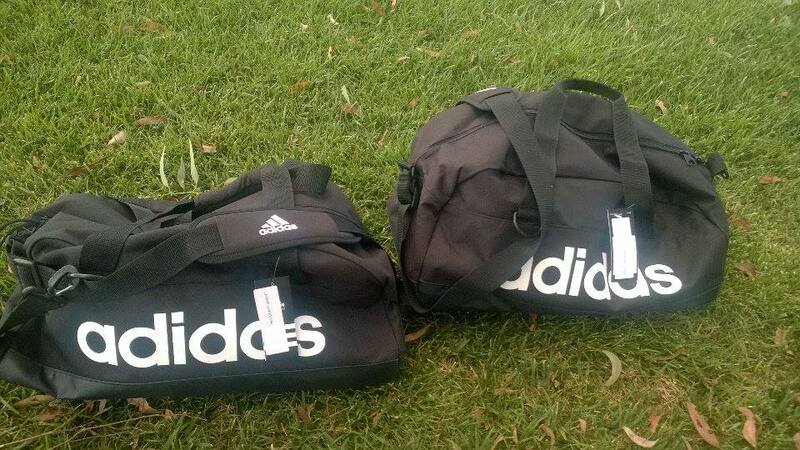 Matching carry on bags. Our official travel kit. Do you travel for your kids sports? Ever had to get kitted out in a travelling uniform on tour? PS Stay tuned for the cankles update and a possible post about how to manage these beasts (which have been known to take on a life of their own and could definitely be physically compared to Quasimodo on occasion). Yesterday's cankles weren't actually too bad. I may have actually cracked the code. PPS Oh, and be sure to check out my Insta-feed! I'm unashamedly in love with my Aruba travel photography. I am seriously counting on Singapore to deliver similar amaze-balls insta-squares. PPS This post was written at 3.00am because yes, I have severe jet lag and have no idea which end is north and which end is south, nor which hour is day or which hour is night. Not sure Singapore is going to help solve this little conundrum. Oh well. I can always sleep on the plane! How exciting for you both! All the best! You are just the most inspiring mum- your kids are so driven and passionate! Oh wow, you jet-setter. I feel for you on the uniforms haha. I think yTravel blog were in Singapore recently; scope their blog for some ideas! How exciting, you must be so proud of your boy... well worth the questionable kit out! Oh, wow! Isn't it amazing when our children inspire us? Off you go, jet setting mum! How exciting for your son, you must be very proud :) Keep your feet up as much as possible and drink lots of water! That's very exciting! Enjoy your travels!